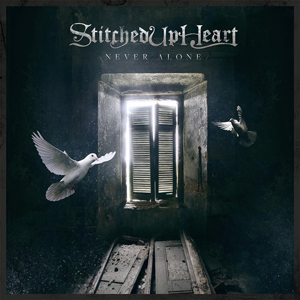 Band To Perform Live At "Revolver Awards"
It’s been a massive year for STITCHED UP HEART and it all gets capped off with the release of their powerful, new music video for “Catch Me When I Fall” which can be viewed now on KNAC.COM right HERE. They will also be performing live at the “Revolver Awards” at Webster Hall in NYC on Dec 13th, where they are nominated in the "Best New Talent" category! You can vote now, as many times as you like HERE. MIXI (vocals) states: “This video was so much fun! I got to be a princess for a day in a castle. I think every girl dreams of that. Plus, we had a demon that the boys tried to save me from. It was interesting watching how all the different scenes come together. For the falling in a crystal ball part, it was shot on green screen while crew members moved my dress with light sabers and blew wind in my face. It was challenging for all of us to act our parts, but we had an amazing director and crew. Everyone worked so well together and overall it was a great learning experience for us. The story is that I'm mesmerized by a light which is actually my inner demons. I blindly follow it as it tries to trap me and when I finally realize what it is, it's too late. The guys all are searching for me because they see that I'm in trouble. I'm falling into my demon's trap and they're trying to save me, to catch me when I fall. The message of the song is the same, it's a call for help. Knowing that sometimes you need those who care about you to help you through tough times in life. It's really kind of a breakthrough song. With "Finally Free", we had a heavy anthem which grabs your attention right away. "Monster" was a little more experimental and a bit heavier. "Catch Me" has a little more mainstream feel to it. We think it will help us reach a larger audience and help us spread the overall message of hope. That when life gets you down, you can get back up whether through sheer will power or with the help of loved ones. We are also so stoked to be able to perform at the 'Revolver Awards.’ We found out we would be performing with the legendary MEGADETH and ZAKK WYLDE, and of course, our label/tour mates and friends LACUNA COIL. It's such an honor to share the stage with musicians you look up to and respect. Plus, being nominated is humbling. It's so rewarding to know that we're being appreciated by our peers. We are ready to blow the roof off that place!"